Haha.. everyone love goodies bag! Is just like receiving a present, hoping to find some surprises inside!Since Baby Yi He going to start her 1st puree soon.. actually is TOMORROW, that means she’s 6 months already!! Woohoo..
Ok back to signing up > so I sign up all the milk powder company I can find in Singapore, to get some goodiesbag.. Kiasu mommy! haha..But so far only 2 company provides super good goodie bag, the rest is either sending you their brochures or totally don’t provide any.. The 1st company ~ Dumex, super efficient, sent about 2-3 weeks before Yi He turn 6 months. 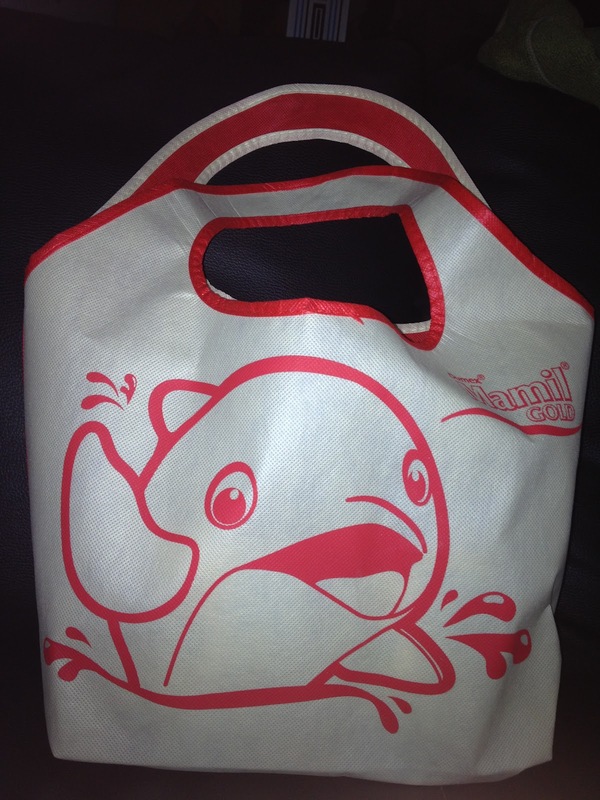 A small eco-friendly shopping bag, with a cute dolphin cartoon! 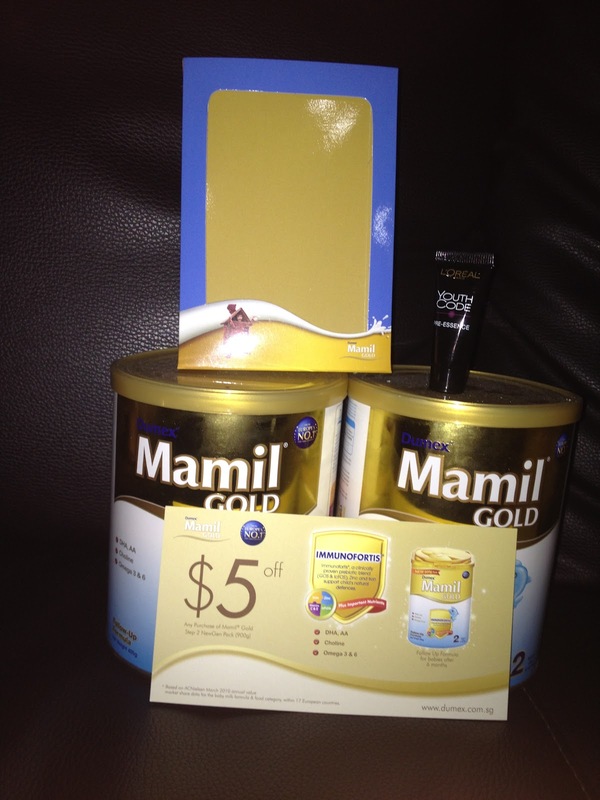 Inside the goodie bag we have a paper photo frame, Loreal skin care product (a bit weird to be inside the weaning bag), 2 cans of 400g milk powder and a $5 off voucher. 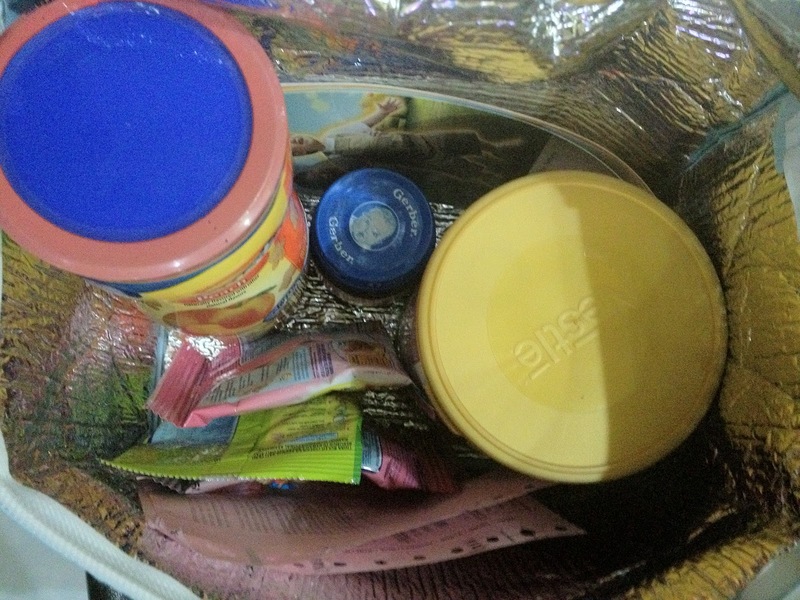 Is a simple goodie bag, but 2 cans of milk powder is considered a generous goodie. As one can of milk is so expensive! 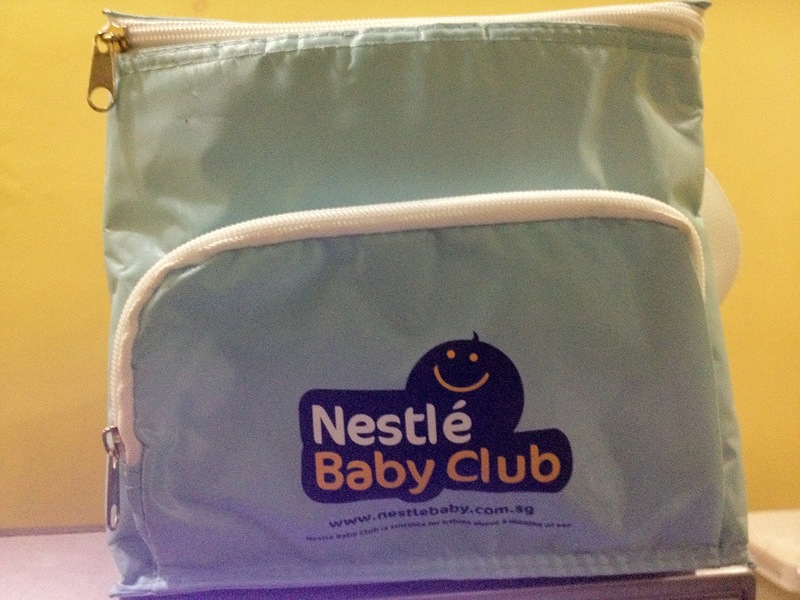 The 2nd goodie bag is from Nestle! The moment I received their goodie bag, I feel very excited to open it up coz it looks very interesting! The goodies! 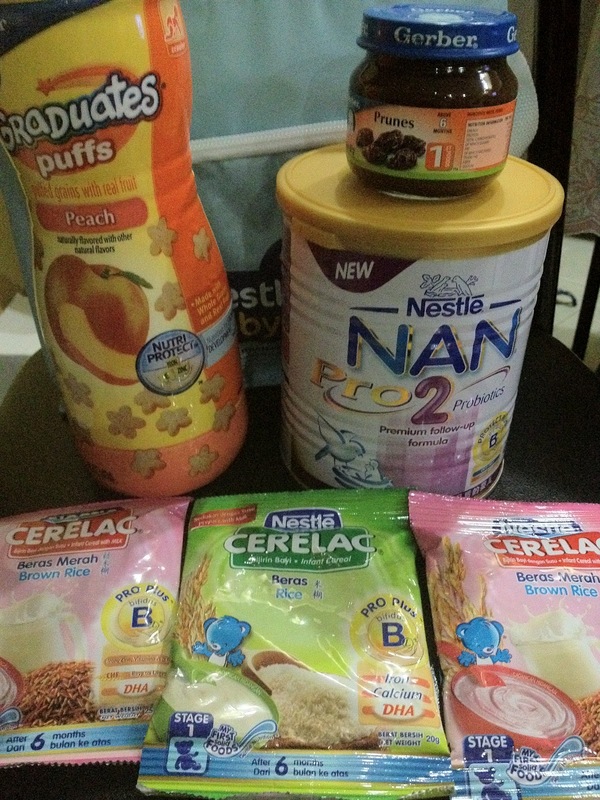 Baby tibits ~ I always find this amazing whenever I feed my nephew last time, can’t wait to see my baby pinching the tibits and trying to put inside her mouth.. haha..
Prunes puree, 1 can of 400g milk powder and 3 packets of cereals. Going to supermarket later to buy some fruits and vegetables to prepare for puree. got a few recipes online and from the brochures. Will share in the new post. Actually I’m glad that her school (infant care) is closed for staff training the next few days, coz I will be the first to feed her and will feeding her continuously for the next 4 days! Is good to start of with me as a mommy, I get to bond even much better with her, monitor how she’s taking, encourage her to eat.. I believe even if the school is not close, I will still take leave to accompany her this moment. Bringing her to the world means its my responsibility to see her through every stage she’s going through. Although I can’t quit my job now, I will try my every best to do whatever I can. Job is not an excuse to miss different stages of your child’s ~ at least this is what I feel.I always remember what my parents said, if u want to have a child, you must be responsible and make some sacrifice. Maybe u feel that, now we are living in the modern society, this may not be able to fit into our lifestyle. But because of my parents responsibility n sacrifice, we are super close to them, and can share a lot of stuff with them, no communication breakdown. Of course we went through rebellious stage at our teenage time. That’s the reason why till now, I refuse maid to take care of my child. Of course my sister and friends to advise me to get, when I’m getting no 2, coz they scared I couldn’t cope. They meant well, true friends scared of my health and my diet. But some I don’t feel that they meant well, they are more interested to see how messy my house is. So what if my house is in a mess, so long as I’m providing a clean and safe environment for them to play and stay, having the closeness bond which I long for and trying my best as a working mom, my hubby and I don’t see that as a issue. P.S Sleeping area must be clean.Clean & sparkling house vs Mother & child bond, I rather choose the latter. I can reach home, clean up my baby, chuck whatever rubbish one side, play with her till her feeding time and put her to bed. Then I do the cleaning up later or if I’m too tired I’ll do it the next day/another day. Sometimes Mr Tan help me to wash my clothes also. I really appreciate his help. Coz no matter how tired I’m, I rather use that energy to play with my kids.I’m not trying to discriminant those who have helper e.g maid. Its good to have helper coz at times I do feel very tired, need a break but with no one around, I will “force” my baby to sleep haha.. So having a helper a not its really up to individual, but for me, nope for the time being.Ok, off to fetch my little girl and to super market! Those who are interested in the goodie bag, just click on the brand, it will lead u there! 😀Btw, share something which I’m excited about! going to work out something with Singapore Cord Blood Bank together with MQ Baby & Kids! Hopefully the outcome will be good! really want to do something meaningful.